Cossie Confidence 2018 is here! Re-CREW-ting now until the 12th August. Hop on Board! . : Sequins and Sand Resort Wear :. 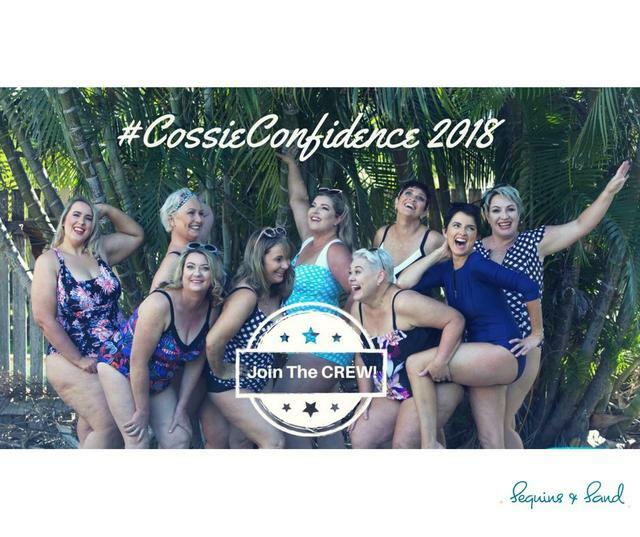 Cossie Confidence 2018 is here! Re-CREW-ting now until the 12th August. Hop on Board! Cossie Confidence 2018 is here and re-CREW-ting has begun! It might be winter but the way time is flying, spring will be knocking on the door before we know it and the mercury will be rising once again...yes! Beach days, pool days and holidays. Much loved times, but for many it's laced with nervous dread. Having the confidence, the Cossie Confidence to get into a swimsuit really does matter. It's the difference between existing through summer and living it; really living it. Helping women to restore their Cossie Confidence so they can make wonderful memories and truly live a fabulous summer goes to the heart and soul of Sequins and Sand. It's the passion that fuels all we do. Why? Because over the last 9 years of fitting swimsuits and helping women to find THAT cossie, we've heard far too many very sad stories and a lot of negative self-talk. And much centres around body loathing, low self-worth and confidence. This has to be turned around because you're all beautiful and life is too short to miss out! #CossieConfidence launched with more gusto last year and you loved it. Our Brand Reps and Crew inspired you to dive into your summer. You learned of their stories. You saw yourself in them. You loved that they were out there, having fun...in their cossies and you were inspired. Cossie Confidence 2018 will build on what we did last year, doubling The Crew with every State and Territory represented. At first, we thought 12, but now, we want to take it to 15! Sequins and Sand will provide swim and resortwear for our Cossie Confidence Crew girls to wear and post about. And there's the chance to be in our October shoot at Hamptonss Holiday House too. To find out all the details on what we're going to do and what we're asking Crew members to do, head over to this page on the CossieConfidence.com.au website. Re-CREW-ting closes on the 12th August with The Crew members for 2018 announced on the 19th of August. C'mon girls. Get around it! Do it for you. Do it for others. Tell your mates. We are looking for passionate women, all different shapes, sizes and ages. Everyday women, women with influence and the power to encourage others too. It's going to be bloody amazing!